The Pathos Classic Remix HiDac integrated amplifier with latest internal DAC module serves as a thorough renewal of one of the company's biggest international hits: the critically acclaimed and award-winning ClassicOne amplifier. The ClassicRemix was designed to meet the more demanding expecations of the audiophile while also grabbing the attention of the younger general public. The versatility of the digital world is unlocked by a high-quality integrated converter and a prolific set of digital connections. This is an accumulation of Pathos' experience gathered in the design and implementation of digital converters for their cd-players as well as in the Converto project and previous versions of the HiDac. The conversion board is facilitated by numerous digital connections on the rear of the amplifier including a SPDIF, SPDIF Optical, USB Type B and an Ethernet to USB Type A. Drawing on the company's twenty year experience in hybrid amplifications, Pathos refined each aspect of the circuitry and carefully selected only the components that met the requirements of high sonic performance resulting in a hybrid Class A/B device with a fully balanced circuit and 70w + 70W power capability. Every effort was made to ensure the amplifier included all the technology neccessary to produce high quality audio, effectively manage digital music files and offer a superior headphone-listening experience. Pathos haven't left anything to chance in their quest to satisfy the discerning audiophile. Using an oversized laminated transformer, developed in partnership with another key supplier, the final section is fueled through stabilisation and bridge rectification, which combines with the 45k-uF filtering capability of the capacitors. The mechanical relays are watertight, and have been specially designed for field audio with all internal contacts sealed under vaucuum to prevent any oxidisation which could impede sound quality. Designed in consideration of the double triode Valves (Electro Harmonix ECC88 - 6922), the preamp section incorporates a one-tube-per-channel differential configuration in order to apprehend the first signal amplification while maintaining the balanced configuration in a way that allows an unbalanced input signal to be converted into a balanced signal. Unlike many integrated amplifiers that use cost-effective solutions and compromises to offer headphone compatibility, the ClassicRemix aims to provide a high-quality performance similar to those of a dedicated amplifier. The Pathos ClassicRemix uses a real amplifier with a strong power supply and fully balanced circuit exploiting the signal from the valve's preamp section which in turn ensures low noise, pure sound and a broad dynamic range. The large bandwidth and generous output power allows easy pairing with most high-quality headphones. The Pathos Classic Remix emanates the contemporary style that Pathos is gearing towards along with the company's fanatical search for balance between industrial design, functionality and aesthetics which has been instilled from its very first device. 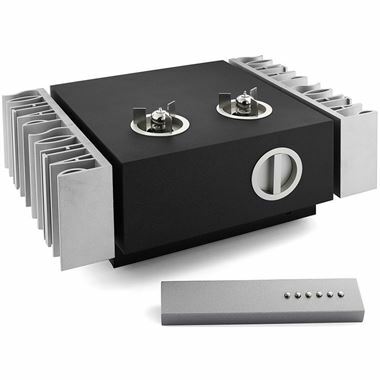 The integrated amplifier features functional elements like the volume knob and valve-protection cages that also add a modern touch to the iconic elements typically found in the audio world. The ClassicRemix is designed to bring the great Pathos sound to a growing audience including those who simply love the Music and beauty. Highly innovative in terms of pure sound quality, Pathos Acoustics succeeded in producing a comprehensive sound with a wide deep soundstage, precise tone, rhythm and energy beyond expectation. With natural-sounding low frequency extensions that never get out of control as well as fine detail, harmony and no signs of fatigue, the Classic Remix is a real ”musical machine” that invites you to rediscover your collection with renewed pleasure and enthusiasm. To meet any customer requirement, the Pathos ClassicRemix is also available with the HiDac internal Digital to Analogue converter. It is also ready to receive future technological developments of digital boards which Pathos have already begun working on.